Page 110: Good lord, what a chatty page. The Gospel of John is the only Gospel that follows its own track entirely – Mark, Matthew, and Luke all share material, although with different systems of ordering (which is why they’re the Synoptic or “same-seeing” Gospels). Matthew and Luke also contain non-Mark material derived from a hypothetical and controversial lost source called Q. Bring this up to a Biblical scholar and watch them turn colors and start talking very quickly. The Gospel of John is a very different document. It was written late in the first century by at least one member of a splinter group – sometimes called the Johannine cult* – of increasingly estranged Christian Jews (not yet a contradiction in terms). It’s the gospel most inclined to a mystical view of Jesus, with Christ as an emissary of the Word bearing a hidden message for the chosen flock. The Johannines were a small group of people under social pressure on all sides – from the Roman provincial government, the Jewish authorities, and even other members of the early church. To some eyes they reacted by pulling inwards and reassuring themselves that they had access to secrets of enlightenment. 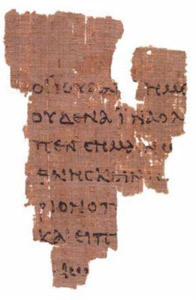 In a lovely stroke of coincidence, the oldest known fragment from the Gospel of John resides in a branch of the John Rylands Library, whose Deansgate building is the one serving as the model for the Familienwald library. *As a side note, on the behalf of my religion professor: the proper meaning of the term “cult” only refers to a group that adheres to a particular religious rite or tradition. No Kool-Aid or crazed eschatology necessarily involved. Page 111: More from the John Rylands Library at Deansgate. Lovely place, innit? 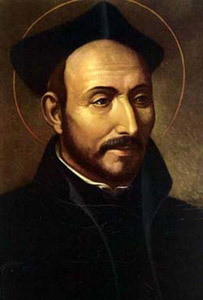 Saint Ignatius of Loyola will be well known to anybody who ever went to Catholic school; in the 16th century he founded the Order of Jesuits, the most academically-minded order in the Church. He made it through the Inquisition despite insisting on open acceptance of conversos, the Spanish/Portugese word for Jewish converts (of whom some were doubtless distant relatives of Spinoza). 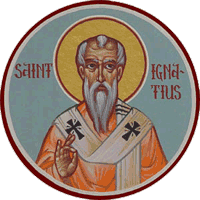 Saint Ignatius of Antioch is a more obscure dude. He was an important figure in the early church, born in 50 CE, and the third bishop of Antioch as well as (purportedly) a student of the above-mentioned Apostle John. He wrote a series of letters which outlined some important early Christian theology before he was hauled off to the Roman amphitheater and subsequently martyred by hungry lions. The Early Church was really a grand old time for a few centuries there. Page 112: Proper book handling – more important than holding a door open for a lady! If you’re ever in a rare book room where they condescend to let you handle the goods yourself – please, for the love of heaven, don’t stick your finger onto the top of the binding and just tip and yoink the book out. You will be yelled at by a cranky staffperson almost immediately. Page 113: My favorite example of the bizarre censorship practices of early modern academia is this: there were, indeed, varying lists naming every book banned by Church and/or College. The lists became more and more comprehensive as time went by, and in some cases became more and more in demand…as people used them as a sort of Zagat’s Guide for finding out what books might make a good, scandalous read. In one instance, and in what can only be characterized as the inevitable conclusion to any system embracing censorship, the list itself was banned. Fabulous. 114: This is the only part of the library for which I don’t have my own reference photographs – the John Rylands Library on Deansgate Street in Manchester is for some reason nervous about allowing the public access to a precipitously high gallery (which you can only reach through climbing an achingly steep, dark, and narrow stone spiral staircase) poised one full storey over their historic reading room. Go figure. 115. The refectory was always an active center of college life. 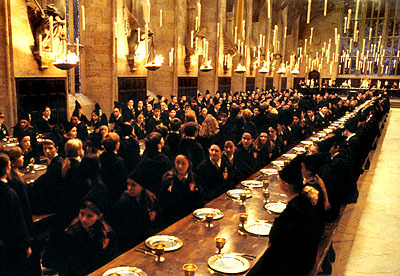 Not much has changed in college cafeterias; this one is based on a famous Christchurch dining hall at Oxford, which some of you might recognize (in altered and CGI-expanded form) from the Harry Potter films. 116. In academic papers, it’s always tempting to either wuss out and write something totally obvious or minute – I once wrote a paper to the effect of “Plato, he sure knew how to arrive at a logical conclusion based on his own premises!” – or to just swing for the left field fence and cram your bizarre convictions about Life, The Universe, And Everything into a seven page lit essay for an elective class you’re taking pass/fail. Luther fell victim to both temptations at different points in his academic career. Of course, it’s always the embarrassing examples that end up circulating. 117: Stay tuned for the Rector’s Mansion! Most schools have an official residence for their head of state, and it tends to serve a double-purpose as the site of upscale fundraisers and official receptions. Whether the president or rector decides to actually LIVE there is another matter entirely. 118. If you have professor parents or were close to any of your own professors in college, you probably have a pretty clear idea of what bitchy little girls faculty members can be. That delicious looking dish right there consists of sausage and some fried onions, although it’s entirely possible they’re noodles, too. In their current condition it would take a full autopsy by a trained medical professional to determine the difference. 119. Tenure: if you achieve sufficient seniority in a department, you’re granted the magical state of tenure, at which point you can no longer be fired for anything but extreme reasons. It’s a desirable state (although one that is increasingly vanishing from the academic scene), one in which you no longer need to chase after temporary positions or panic about publishing enough papers. It is as close to safe as you can be in the academic profession, and thus people will do a lot of intense things to get there. Like hitting on Ariana. Somebody wondered why Ariana isn’t using a candle snuffer in the interstitial scene, here, since even smoke from a beeswax candle (which these are) can filth up a stone pillar something awful. To which I say: really, guys? A snuffer?